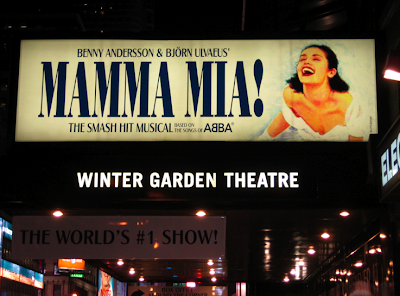 strolling new york: Mamma Mia..! Sunday I saw Mamma Mia the Movie. Basically I agree with NY Times. However Mamma Mia made it to strolling by the mere fact that the ads are all over this city. Buss stops subway cars subway stations yellow cabs poster walls. No way anyone hasn't seen the beautiful happy brunet for the musical and blonde for the movie. They are in a third of my photos. And every time I see those ads I feel so happy. Btw. The movie is well worth its 1.48 - not only for laughing tears at a singing Brosnan - but also for the Swedish address the Swedish flag the Swedish Björn Andersson playing piano and - most of all - the Swedish Joseph Frank's exclusive fabrics as hung laundry.